Carmen is of the Kiyannie (Towering House People) clan, born for Ma'iideeshgiizhnii (Coyote Pass) clan, her paternal grandfather is Todechine, and her maternal grandfather is Nakai Dine'e. She is compiling photographs of her extended family living in the Canyon de Chelly area. Her goal is to publish a thematic book of these images to help preserve both the pictorial and oral traditions of her family. Carmen's experiences as a guide in the canyons and areas around Chinle, Arizona have brought her into contact with many notable photographers. She has assisted landscape masters David Muench in his book "Windstone: Natural Arches, Bridges, and Other Openings", Tim Meyer--Portrait Department Chair at Brooks Institute, and LeRoy DeJolie, with his book: "Navajoland--A Native Son Shares His Legacy". Carmen currently works closely with master portrait and commercial photographer, David Davis. She contributed her skills as a professional Navajo court interpreter, general translator, and language teacher to Facerock Productions' "Native Faces-Desert Light" film production. She translated and narrated many of the voice tracks for this show. These experiences have given Carmen a learning experience in the relationship of light to the photography of people to fine-tune her skills for success at juried shows and markets over the past five years. These include the Southwest Association for Indian Arts, the Navajo Nation Fair, and the Heard Museum Guild's annual show. She has numerous awards including several "Best of Show" and "First Place" at the Navajo Nation and Heard Museum exhibitions. This year her photography was awarded second place at the Santa Fe Indian Market and we look for great things from her in 2012. Several of her photographs are featured in Turtle Island's 2008 and 2009 "Indian Country" calendar. She is currently working closely with Earle Couture, a Navajo fashion design company, in producing their 2012 fashion calendar and poster series. Currently, David Davis is the full-time photographic artist with Facerock Productions. As our product line gains greater distribution, we will add images from more photographers whose work compliments our mission and our message. Master photographer, David Davis, works from his office in Grand Junction, Colorado. For many years he has traveled the Colorado Plateau creating illustrations of his Native American friends in this incredible landscape. David holds a degree in Western American History along with the PPA Master Photographer and Craftsman degrees. He is currently writing his thesis on the state of fine art photography as defined by changing technology for the American Society of Photographers. Having experienced over forty years of changes in the photo industry, Davis is committed to promoting the archival quality of photographic imaging. 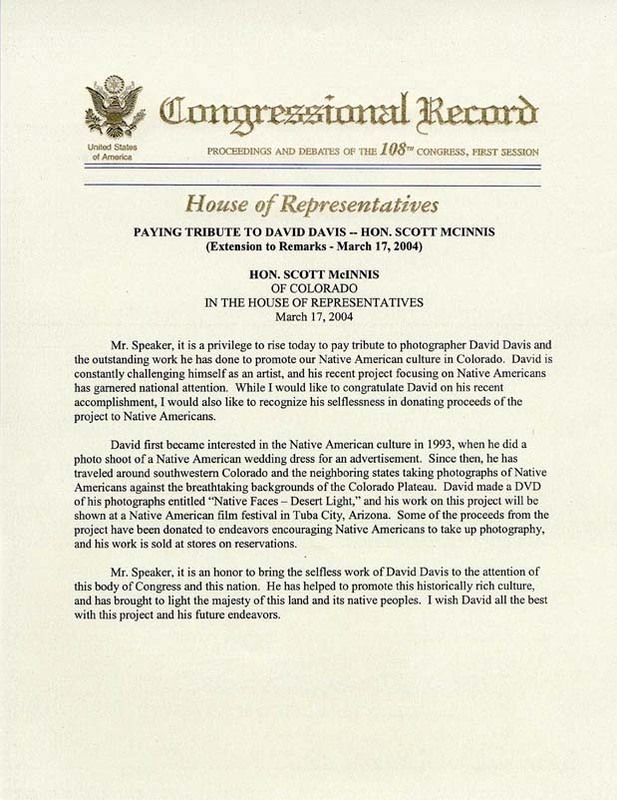 In 2004 David's efforts were entered into the Congressional Record by Congressman Scott McInnis--you can click here to see that tribute. David is experienced in both portrait and landscape illustrative photography and shares his knowledge through a variety of workshops and mentoring programs. Showing beauty, dignity, and relationships are important parts of his photographs. He has added an new program for 2012 that allows one or two photographers to accompany him on his personal projects as they unfold. For more information, you must contact David directly at his office to see if you qualify and to see where he is headed with his "Women Warriors", "Cliff Dwellers", and "Rock Artist's" projects--CLICK HERE for his contact information.